This quotation is the theme of Larry Tagg’s 2009 book, The Unpopular Mr. Lincoln, which utilizes thousands of primary sources to make the case that no American president was more reviled by his contemporaries — at home and abroad — during his own lifetime than Abraham Lincoln was. Tagg is no Southern apologist: He is a native of Lincoln, Illinois, and profusely thanks Harold Holzer, one of the high priests of the Lincoln cult, in his acknowledgements. This book establishes Mr. Tagg as a card-carrying member of the cult. 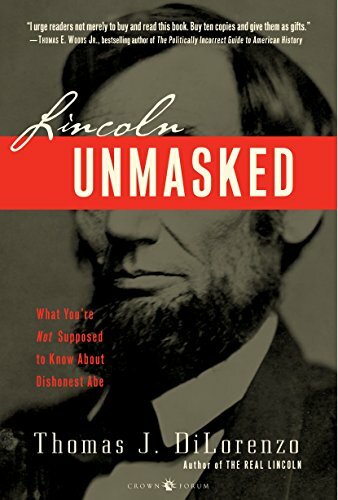 Anyone who has read The Real Lincoln (or scanned the "King Lincoln Archive" at LewRockwell.com) would not be surprised at all to hear that Lincoln was hated and reviled by most of the "great men" (and the Northern masses) of his time. 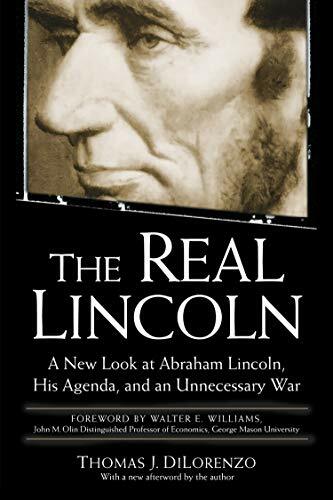 As Tagg hesitantly admits in his Introduction, Lincoln was widely criticized in the North as a "bloody tyrant" and a "dictator" for his "arbitrary arrests, the suspension of habeas corpus, and the suppression of newspapers . . ." More specifically, imprisoning tens of thousands of Northern civilians without due process for verbally opposing his policies; shutting down over 300 opposition newspapers; deporting an opposing member of Congress; confiscating firearms and other forms of private property; intimidating and threatening to imprison federal judges; invoking military conscription, income taxation, an internal revenue bureaucracy, and huge public debt; and ordering the murder of hundreds of draft protesters in the streets of New York City in July of 1863 are all good reasons why Lincoln was so widely despised. 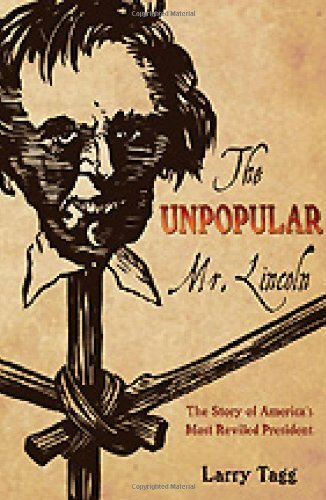 The inside cover of The Unpopular Mr. Lincoln claims that it is the first book ever written on how unpopular Lincoln really was. Well, not really. "Mainstream" Lincoln scholar David Donald remarked in Lincoln Reconsidered that Lincoln was wildly unpopular in his own time. Edgar Lee Masters wrote of the near universal hatred of Lincoln by his contemporaries in Lincoln the Man; and historian Frank L. Klement, author of Lincoln’s Critics: The Copperheads of the North, spent a career researching and writing about Lincoln’s Northern critics. Freedom Under Lincoln by Dean Sprague and Constitutional Problems Under Lincoln by James Randall also discuss the critics of Lincoln’s tyrannical and dictatorial behavior, although these authors do their best to whitewash it all. The most interesting chapter of The Unpopular Mr. Lincoln is the final Epilogue entitled "The Sudden Saint." Here Mr. Tagg explains how the Republican Party, with the aid of the Northern Yankee or neo-Puritan clergy, created out of thin air the myth of the "sainted" and "beloved" Abraham Lincoln. In order to understand why the role of the neo-Puritan, New England clergy was so important, one must understand that it was their neo-Puritanical religious fanaticism that fueled the war-making ideology of the North during the war. In his essay, "America’s Two Just Wars: 1775 and 1861," Murray Rothbard accurately described it as "a fanatical and emotional neo-Puritanism driven by a fervent u2018postmillenialism’ which held that, as a precondition for the Second Advent of Jesus Christ, man must set up a thousand-year Kingdom of God on Earth." Moreover, this "kingdom" is "to be a perfect society . . . free of sin," especially slavery, alcohol, and Catholicism. So it should not be surprising that the Yankee clergy teamed up with the Republican Party after Lincoln’s death to deify him. Lincoln’s assassination was a miracle of luck as far as they were concerned, for it put in their lap an opportunity to deify their Big Government political agenda along with Lincoln himself. As Larry Tagg explains, the Republican Party "saw that his death was a propaganda windfall — Lincoln could be made to stand for the North, for freedom . . . "
Of course, they all knew that in his first inaugural address Lincoln supported a constitutional amendment that would have explicitly enshrined slavery in the Constitution; that he wrote a public letter to Horace Greeley explaining that his sole objective in the war was "to save the union" and not to disturb slavery; and that his real "last best hope" was "colonization," or the deportation of all black people from America. This all had to be forgotten, and history rewritten. And it was. Senator James Grimes of Iowa immediately recognized that the deification of Lincoln by the Yankee clergy and the Republican Party "has made it impossible to speak the truth of Abraham Lincoln hereafter." Media opposition to the Republican Party, which was the federal government for the next several generations, was rendered prostrate. The South was under military occupation for twelve years after the war. Consequently, ministers there were ordered to deliver sermons deifying Lincoln while many Southern newspapers were forced to do the same. These editors were "installed by Union armies" in the occupied South, as Tagg explains. Southern journalists were made to understand that the penalty for challenging the newly-invented Lincoln mythology was the "terror of confiscation and imprisonment." Not surprisingly, there were "sudden proclamations of Lincoln’s nobility" all throughout the South as well as the North. 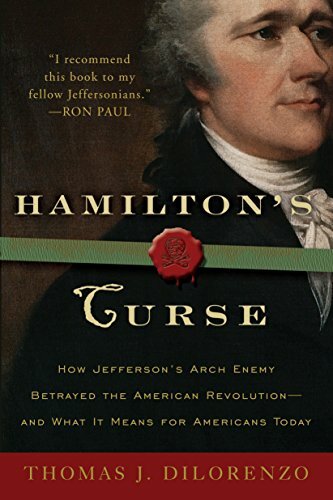 Thus were born the myths and superstitions about America’s most reviled president.